Col. Francisco Mendoza Jr. and Mayor Susan Ang during the ceremonial signing of the joint declaration of San Isidro, Leyte as Stable Internal Peace and Security municipality on March 28, 2016. KANANGA, Leyte – The town of San Isidro in the third district of Leyte was officially declared as Stable Internal Peace and Security municipality. 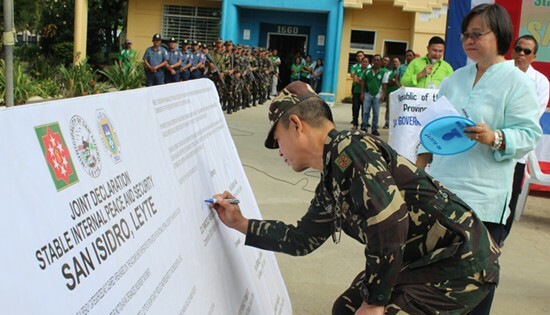 During the flag raising ceremony on Monday, March 28, incumbent Mayor Susan Ang, Colonel Francisco Mendoza Jr of Philippine Army's 802nd Brigade and Police Superintendent Ramil Amodia of the Leyte Provincial Public Safety Company signed a joint declaration of Stable Internal Peace and Security San Isidro, Leyte. Other signatories were Vice-Mayor Isidro Balmoria, Lt. Col. Roberto Sarmiento, Commanding Officer of the 19th Infantry Battalion, and Senior Inspector Jimmy Boy Balasanos, the Chief of Police. Mayor Ang signed the declaration by virtue of SB Resolution No. 049-2015 which was adopted after 19th Infantry Battalion's periodic assessment on the peace and security situation in the said town last year. Lt. Col. Roberto Sarmiento, commanding officer of the 19th Infantry Battalion said San Isidro is already the 19th municipality the unit has declared stable internal peace and security since 2014. "We have seven (7) towns and cities left to clear before end of this year. These are the towns of Villaba, Isabel, Capoocan, Jaro, Tanauan, Tacloban City and Ormoc City", Lt. Col. Sarmiento said. The municipality of San Isidro, Leyte was also an erstwhile lair of the dismantled "Buhawi" Platoon of the New Peoples Army (NPA) in Leyte on the early year 2000. In collaboration with the 19th Infantry Battalion and the Philippine National Police, the local government of San Isidro was able to maintain and peace and security situation in the municipality. PASAY CITY – "From special screws, overcharging of non delivered stickers, late license plates and no available driver's license, frequent MRT breakdowns, abandoned license plates at Customs, and now stolen plate sheets?" This was the reaction of vice presidential bet and Senate Majority Leader Alan Peter Cayetano on the reported disappearance of some P4-million worth of license plate sheets from the facility of the Land Transportation Office (LTO) during the Holy Week break. "Wala na ngang mga plaka na maibigay ang LTO sa mga motorista, pinanakaw pa ang mga materyales sa paggawa nito. Abot langit na ang kapalpakan at gulo na ito. Hindi ko alam saan kumukuha ng tibay ng apog ang mga opisyales na ito para manatili pa sa kanilang mga pwesto," Cayetano said. The senator called for the firing and/or resignation of Department of Transportation and Communication (DOTC) Secretary Joseph Emilio Aguinaldo Abaya and LTO Chief Roberto Cabrera. He lamented the silence and lack of action on the part of the national government on the issue, particularly the DOTC, which is the mother agency of LTO. "There should be no sacred cows! Kawawa naman mga ordinaryong empleyado ng mga ahensiyang ito na ilang taon nang tumatanggap ng galit at puna mula sa publiko. Pero ang mga opisyales naman talaga nila ang may problema," Cayetano said. “If there’s still some delikadeza and command responsibility left in Abaya and Cabrera, I demand that they immediately vacate their posts and let more capable individuals do their jobs," he added. Cayetano said that if he and his running mate, Davao City Mayor Rodrigo "Rody" Duterte, will be elected, they will cleanse the government's transportation agencies such as the LTO, the Land Transportation Franchising and Regulatory Board (LTFRB), and the DOTC, of corruption and ineptitude. "How can we expect this government to protect the people if they can't even protect metal sheets? And yet they want continuity? Mayor Duterte and I will not allow the ineptitude and corruption to continue. This will all stop," Cayetano said. "We will provide leadership and political will. Mayor Duterte and I will end the disorder in the lives of the people and effect real change," Cayetano concluded. NAVAL, Biliran – District Engineer David P. Adongay Jr. gave information that the Department of Public Works and Highways (DPWH) - Biliran District Engineering Office (DEO) will be the next in Region VIII to be assessed among the DEO’s Region wide that is geared towards (ISO) Certification. Adongay said that they are now slowly undertaking necessary requirements to acquire ISO 9001; 2008Certification as a benchmark for setting Quality Management System. Aside from complying ISO Documentation which includes all written procedures, quality manuals, work instructions, periodic auditing etc. Adongay disclosed that they are now also in the move of improving its facilities and resources in the office as well as their human resources. According to the District Engineer, being ISO certified also means to understand the apparent needs of the customer’s or more importantly exceed customer’s satisfaction. He emphasized that DEO must also be customer-focused. “We don’t want the public to decry us as inefficient, wasteful and comfortable with substandard because these are the source of irritations and bitter frustrations” explained Adongay. Adongay also said that in their anticipation for ISO certification, they are focusing on several niche areas such as mindset and attitudes to achieve excellence, positive values towards work, skills in human capital development and quality leadership. “We Engineers want quality projects and services as people expect of us on this aspect”, he added. The ISO Certification is part of the Department’s program for improving effectiveness and efficiency in serving the public. It is one of the DPWH Secretary Rogelio Singson’s aspiration to all the agency’s regional offices to be ISO Certified before he will step down in position by June after the May 2016 election. CEBU CITY – Hundreds of members of progressive and environmental groups trooped to the City Hall of Cebu City to express their opposition to the proposed construction of a coal-fired power plant in Barangay Sawang Calero in just as a public hearing by the city council was taking place. Sanlakas and Philippine Movement for Climate Justice (PMCJ) brought with them a coffin to symbolize the adverse health impacts on the residents if the proposal pushed through. The public hearing was requested by the Ludo Power Corporation together with its consultant Geosphere Technologies Inc. after the Committee on Environment led by Councilor Nida Cabrera initially declared that the project was “environmentally critical”. “The city council maybe sending a wrong signal to its constituents. By considering the proposal of putting up another coal plant for the purpose of providing reliable but dirty energy supply for future investors in the name of progress is based on convoluted logic and a flawed concept of social development, said Sanlakas lawyer and nominee Aaron Pedrosa. He added that, “the scientifically established proof that coal plants have detrimental health effects on the communities surrounding it and its massive contribution to the climate crisis are enough for the people of Cebu to reject the project. The city council must once and for all get a shot of political will in order to swerve a way from a hazardous development path towards stewardship of natural resources and people-based development”. The group used the demonstration to remind the city council of its three-year old commitment in form of a passed city council resolution supporting the demand for a moratorium on the establishment of carbon-intensive and fossil fuel based technologies in favor of transitioning to renewable sources of electricity. Meanwhile Inday Olayer of PMCJ said that they plan to furnish members of the City Council copies of the recently published Greenpeace study in partnership with the Harvard University, PMCJ and local health non-government organizations. Among the rallyists was Dadang Majo of Talisay City who has had first-hand experience of the economic impacts of coal combustion. Majo attested that since the commencement of the operation of the coal-fired thermal plant of Korea Electric Power Corporation-SPC Power Corporation’s plant in the City of Naga, seven miles away from her residence, “fish catch has rapidly declined”. The groups pledged to untiringly challenge all arguments LPC executives and will mobilize more people to effectively amplify the voice of the hundreds of thousands of would be victims of coal combustion. CAMP VICENTE LUKBAN, Catbalogan City – The 8th Infantry (Stormtroopers) Division participates in the observance of Lenten season through various activities here, from March 20-27, 2016. On the 20th day of March was Palm Sunday with a Holy Mass purposely to re-enact the triumphant entry of Jesus into Jerusalem held in front of Headquarters and Headquarters Service Battalion. A Maundy Thursday mass and Last Supper were also offered with Major Rey David A Loyola, Division Chaplain and the 12 apostles followed by a vigil of blessed Sacrament in Sto. Niño post chapel. 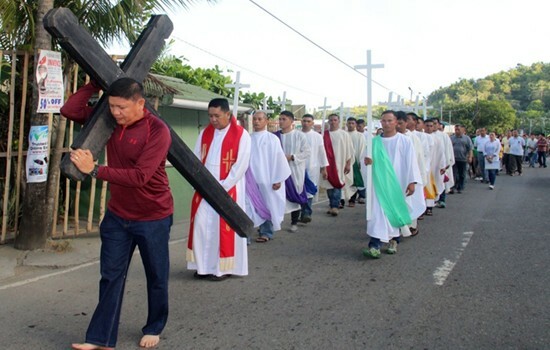 On Good Friday, a station of the cross was conducted around the camp headed by Maj.Gen. Jet B. Velarmino, 8ID Commander, to observe the Lord's death and veneration of the cross, whereas the Black Saturday also known as Holy Saturday is in commemoration of the time when Jesus laid in the tomb after his death which was celebrated through Easter Vigil Mass at the Command Chapel. Prior to the Easter Sunday mass on the 27th of March 2016, the re-enactment of the 1st "Encounter" (Salubong) of Mother Dolorosa and the risen Christ was conducted at 4:30 a.m. at the Division Grandstand. This was followed by the ancient tradition of fun and frolics through Easter Egg Hunting for the children to celebrate Easter Sunday. It is a traditional symbol of fertility and rebirth in Christianity that symbolizes the empty tomb of Jesus and resurrection. Subsequently, a breakfast in 8ID park was offered by Maj. Gen. Jet B Velarmino and Madam Imelda Velarmino together with the other officers, men and civilian employees of the Command. Maj. Gen. Velarmino shared that it is the duty of every soldiers to be at service to the people especially in times when everyone is busy attending to their spiritual needs. "Let us choose the path of righteousness and love of country and people in Gods Way", Velarmino added. NAVAL, Biliran – The Department of Public Works and Highways (DPWH) - Biliran District Engineering Office (BDEO) Acting Chief of Planning and Design Section, Engr. Rosario B. Rosete revealed that they are slowly preparing a portion of Naval-Caibiran Cross Country Road (Calumpang Road Section) for future road widening project. Engr. Rosete in an interview said that the construction of covered drainage along Calumpang Road section has been strategically located after a one lane space on both sides from its existing pavement to prepare it for future widening project. “Parang widening na rin yan kasi 1 lane ang prinepare naming as shoulders sa left and right side ng road”, said Rosete. However, Engr. Rosete clarified that it is still not a road widening project in as much as the thickness of the pavement does not conform to the standards of a widened pavement considering that the main project is construction of drainage only. She explained that Widening is the construction of one lane pavement with a width of3.05 m. on both sides of the existing pavement with a thickness of 0.28 meters. She further disclosed that as of now they are still hesitant to widen the road in front of the Municipal Hall to the Philippine Port Authority because the office will not be paying anymore for the damages affected by the widening project. She explained that as per advise by legal authorities of the DPWH Regional Office VIII, payment for damages is not allowed since the road is a National Road. It was also informed that BDEO is the only District Engineering Office that was paying for the damages affected by the road widening project in Region VIII. There is an estimated P50M damages of property on the said section if ever road widening will be implemented. “Kaya hesitant kami mag-widen from Municipyo to downtown kasi walang bayad at malalaki ang mada-damage kaya titigil muna kami, pero possible for widening talaga yan kasi malaki ang AADT (Annual Average Daily Traffic) nyan”, said Engr. Rosete. Along Naval-Caibiran Cross Country Road (Calumpang Road Section) lies several government agencies both local and national agencies such as the Naval Provincial Capitol, National Food Authority (NFA), Department of Agriculture (DA), Department of Tourism and the Department of Public Works and Highways (DPWH)-Biliran. ORMOC CITY, Leyte – The Department of Agrarian Reform (DAR) has declared the Fran Farm case that has dragged on for 16 years closed after the two involved rival farmer groups agreed and signed the final compromise agreement on March 10 this year. This milestone achievement in the implementation of the Comprehensive Agrarian Reform Program in Barangay Matica-a in this city started in December 2015 when the Bugho Farmers Association (BFA) offered the 21 hectares to the Fran Farm Workers Association (FFWA) while keeping the 25 hectares with the former. In 2015 the DAR Adjudication Board (DARAB) ruled with finality awarding the entire 46 hectares to the BFA. Leyte Provincial Agrarian Reform Program Officer Renato Badilla, who led DAR officials in facilitating the negotiation, expressed hope that a better environment will govern the FFWA and the BFA and finally lead to peace and development in the area, a peace that has been elusive for a long time. BFA president Rosenda Apay and FFWA leader Benjie Malinao led their respective groups in signing the final compromise agreement that provides: the grant by the BFA of the 21 hectares in favor of FFWA, with the 25 hectares retained by the former; conduct of subdivision survey by DAR on the two landholdings; mutual recognition and respect of each other as qualified farmer beneficiaries; dropping off of claims, legal suits and charges leveled against each other; recognition of homelots occupied by FFWA farmers inside the 25 hectares allocation by the BFA; issuance and registration of individual CLOAs among the FFWA members for the 21 hectares, while BFA opted for a collective CLOA for the 25 hectares; DAR will facilitate with the DARAB the approval of the final compromise agreement; and DARAB to issue the corresponding appropriate order enforcing the final compromise agreement. Aside from DAR officials, the signing of the said document was witnessed by non-government organization representatives Rina Reyes from RIGHTS and Rubie Espina from KAISAHAN. Present as well are local officials and members of the Philippine National Police (PNP). The controversy started in 1999, when the rival groups questioned the identification and qualifications of each other as agrarian reform beneficiaries (ARBs) to a landholding formerly owned by Teofilo Fran which resulted to a series of legal actions and litigations lasting for 16 years. Bad blood worsened when an FFWA member was shot and killed inside the DAR Ormoc City office premises during a court hearing on the case by still unidentified perpetrators. Today, both groups are already peacefully installed and tilling their respective areas. CEBU CITY – Environmental groups who converged in Cebu yesterday for the second leg of the PiliPinas Presidential Debates 2016 expressed disappointment at the candidates’ lack of any clear positions and plans regarding urgent environmental issues challenging the country. More than 2,000 environmentalists, farmers, scientists, representatives from the academe and the church, and members of local and national groups from all over the Philippines had come to Cebu to press candidates for clearer positions on environmental issues in their governance platforms. “From what we’ve seen so far, the Presidential candidates need a more thorough understanding of environmental issues that have to be quickly addressed, as these greatly affect other developmental problems such as poverty, health and food security. They make vulnerable sectors even more vulnerable the longer they are left unchecked,” said Naderev “Yeb” Saño, Executive Director of Greenpeace Southeast Asia. “The Presidential aspirants make sweeping statements about environmental challenges such as climate change and disaster response, agriculture and farmers’ plights, or energy and development, but either they are merely pandering to popular demands with no clear plans, or are doing the opposite of what they supposedly espouse in their campaign speeches,” added Ruth Ylanan, representative of the Urban Poor Alliance (UP ALL). The groups point as examples: Mar Roxas stating that the country needs to shift to clean, renewable energy but their current administration facilitated the entry of 25 new coal-fired power plants and himself propagating the myth that solar energy is expensive; Rodrigo Duterte acknowledging that the Philippines is at the forefront of climate impacts but going against any bid for the Philippines to phase out coal; Grace Poe pushing for benefits for farmers and agriculture but having no clear position on protecting organic farmers and ensuring safe food; Jejomar Binay not discussing any position or plans regarding any of the environmental issues that were supposed to be discussed at all. Led by the Sugboanong Nagpakabana sa Kalikupan (Concerned Cebuanos for the Environment), which includes Greenpeace Philippines, the group is part of the bigger Green Thumb Coalition "Pwersa ng 10 Million Boto" that aims to influence candidates' debates and public discussions around key environmental concerns. The coalition earlier sent letters to the Presidential candidates asking about their platforms around issues such as biodiversity, natural resource management, climate justice, mining, energy transformation, sustainable agriculture and fisheries, wastes, and other environmental challenges. The groups were hoping for more comprehensive discussions and more substantive reactions to their concerns during the Cebu leg of the debates. "Cebu has continually pushed for and led the national discourse on environment issues. It would have been great if we finally got to hear concrete plans for our only home discussed in detail here, and not just motherhood statements. Let’s hope the third and last leg of the debates yields better results," said Sister Virgie Ligaray, RVM, of the Association of Women Religious of Cebu. QUEZON CITY – Amid the country’s impressive Gross Domestic Product average growth rate of 6 percent last year, a combined 10.3 million workers were affected as the daily minimum wage levels nationwide fell by an average of P96.95 a day or P2,520 a month starting January this year due to inflation, the labor group Trade Union Congress of the Philippines-Nagkaisa (TUCP-Nagkaisa) said. Quoting data from the National Wages and Productivity Commission (NWPC) data released February 12, the group said the real value of the P481 nominal daily minimum wage in the 17 cities and municipalities in Metro Manila, for example, is worth P364.39 a day beginning January this year. The nominal value fell by P116 a day or P3,016 a month. “The lost value of the daily wage can buy them a kilo of imported, first class, deliciously fragrant rice and three variant of pagpag food for one good meal the entire family have not eaten for years. But if we look at the entire value lost in a month, it can cover for house rent, or water and electricity, or tuition fees,” said TUCP spokesperson Alan Tanjusay. Real wage are wage in terms of the amount of goods and services that can be bought. For example, the current capacity of daily nominal minimum wage of P250 in Autonomous Regions of Muslim Mindanao (ARMM) to buy goods and pay for services in the region is only P157.43. The nominal value fell by P92.57 a day or P2,406.82 a month. The difference between wage and cost of goods and services is shown in the recent government survey showing a combined 10.348 million unemployed and underemployed workers dissatisfied with their salary because of the rising costs of services and the increasing prices of commodities reaching almost eight million, he said quoting recent data of the government’s Labor Force Survey (LFS) released ten days ago. The LFS according to the Philippine Statistics Authority (PSA) released on March 11, out of 67.153 million work force, there are 40.047 employed Filipinos and 7.879 million of which are underemployed while 2.469 million are jobless. “The painful implication is that there are almost 8 million working Filipinos who do not progress because they cannot even afford the minimum standard daily cost of living (food & non-food needs) valued at P21.28 for each member of family of five. This is a typical example of a race to the bottom where the value of a day’s labor can no longer meet the family needs,” Tanjusay said. He said the labor center projected the poverty threshold amount for the first quarter of 2016 to be at P9,576 per month for a family of five or P319.20 a person per month, P63.84 a person per day or P21.28 a person per day. Comparing with the existing Metro Manila wage level, the real daily wage is equivalent to P9,474.14 a month. It’s capacity to buy goods and services for a family is P315.80 every day or P63.16 per person a day or P21.00 a person per meal per day. Fixed every three years by the National Economic and Development Authority (NEDA), Department of Trade and Industry (DTI) and the Food and Nutrition Research Institute (FNRI), the poverty threshold amount is a standard amount needed by a Filipino family of five in order to live economically and socially productive. Based on the first semester of 2014 standard poverty threshold report announced by the PSA on March 6, 2015, a family of five needs at least P8,778 a month or P292.60 a day or P58.52 per person a day which is equivalent to P19.50 per member of the family for food (breakfast, lunch and dinner) and non-food needs. The low value of wage, he added, is what drives thousands of workers every day to work abroad despite the social cost of family separation. Other reasons are the lack of employment opportunities, the jobs-skills mismatch and the government’s passive enforcement of employers’ compliance to minimum wage. “We urge government to make growth more inclusive by equitably sharing our country’s wealth by consistent enforcement of labor laws, stronger enforcement and regulation on prices of goods (food) and cost of services (water, electricity and transport fares), give more subsidies and cut taxes. We ask employers, on one hand, to pay it forward in sharing their profits by increasing motu propio the salary of their workers,” Tanjusay said. In 2012, The government’s poverty threshold amount was pegged at P7,821 a month. Tanjusay said the TUCP-Nagkaisa proposed to President Aquino in May last year a menu of short-term poverty-mitigating executive measures for minimum-waged earners cope with the rising inflation. These proposals includes a P2,000 monthly cash subsidy, income tax cut, unemployment insurance and return of government subsidy to mass transport trains MRT and LRT. “However, none of these offered proposals were yet acted upon by the president. It looks like this race to the bottom wage problem will be passed on to the next elected president in July,” he said. PASAY CITY – Infusing more funds to help lift the ailing agriculture sector would be more meaningful for farmers if stricter policies are put in place to fight the influx of cheap agricultural products smuggled into the country, vice-presidential frontrunner Sen. Francis “Chiz” Escudero said. Under “Gobyernong may Puso,” Escudero and his presidential running mate Sen. Grace Poe are pushing for additional P300 billion in funds for the agriculture sector, if they win the election, to boost the industry battered by high cost of production, extreme weather condition and poor support services from the government. According to Escudero, increasing the budget allocation of the sector, which is comprised of 60 percent of the country’s poorest, would be useless if farmers won’t be able to sell their yield at competitive prices because of smuggling. “Dapat tayo ang mag-export ng ating mga produkto kaya dapat solusyonan ang problema sa smuggling ng agricultural products galing sa ibang bansa dahil nalulugi ang ating mga magsasaka,” Escudero said. A study by the Southeast Asian Regional Center for Graduate Study and Research in Agriculture (SEARCA) indicated that the value of smuggled agricultural items into the country ballooned to more than $10 billion annually by year 2008 from $6 billion during the 1980s. SEARCA also cited data from the Department of Agriculture-Bureau of Agricultural Research (DA-BAR) on domestic agricultural production and consumption from 1986 to 2009, which pointed to entry of illegally shipped milled rice ($1.196 billion), refined sugar ($448.2 million), beef ($428.8 million), onion ($259.55 million), pork ($117.45 million), chicken ($27.8 million), ginger ($7.8 million), and carrots and turnips ($6.5 million). “Hindi lang ang mga kalamidad at kawalan ng suporta mula sa pamahalaan ang matinding kalaban ng ating mga magsasaka kung hindi rin ang walang humpay na smuggling ng mga produktong agrikultura galing sa ibang bansa tulad ng bawang, sibuyas at asukal,” the veteran lawmaker said. Escudero, however, assured that anti-smuggling measures will be a priority of the government led by Poe. “Layunin namin ni Sen. Grace na tapusin na ang paghihirap ng ating mga magsasaka at mangingisda sa pamamagitan ng mas malaking badyet mula sa pamahalaan at pagpigil sa mga nagsasamantala sa kanilang kahinaan,” Escudero said. As legislators, Poe and Escudero have separately filed bills aiming to curb smuggling in the country. Poe has filed Senate Bill No. 2348, which seeks to define smuggling as an act that constitutes economic sabotage. Escudero, on the other hand, filed Senate Bill No. 422 or the Anti-Smuggling Act, which amends the Tariff and Customs Code of the Philippines to stop smuggling, simplify rules and facilitate trade transaction, among others.